The men and women who serve our country in uniform too often suffer debilitating physical, mental, and emotional difficulties after their service have ended. Though healthcare for veterans has been an ongoing national discussion for some time, relatively little attention has been paid to the most common disabilities diagnosed in veterans: Tinnitus and hearing loss. According to the Center for Disease Control and Prevention, veterans are 30% more likely than civilians to suffer from severe hearing impairment–even when age and occupation are taken into account. Though service-related hearing loss has been documented going back to the second World War, the numbers are even more dramatic for military personnel who served after September 11, 2001. The same CDC report notes that recent veterans–who are also, on average, among the youngest former service members–are four times more likely than non-veterans to suffer from severe hearing impairment. Why Are Service Personnel at Greater Risk for Hearing Loss? Two words: Noise exposure. Sure, some vocations are noisier than others. Say you’re a librarian (and it’s not story time, so there aren’t a bunch of little kids running around!). You’d likely be exposed to decibel levels ranging from a whisper (about 30 dBA) to normal conversation (60 dBA). At the other end of the sonic spectrum–for civilians, anyway–let’s say you’re a construction worker, and you’re on a job site that’s in the city. Sounds you’d hear constantly (heavy traffic, about 85 dBA) or sporadically (an ambulance siren’s around 120 dBA) are at hazardous levels–and that’s just background noise. Research from the National Institute for Occupational Safety and Health (NIOSH) has found that construction equipment noise, from everything from power tools to bulldozers, exposes workers to sounds louder than 85 dBA. As loud as a heavy construction site is, active military personnel are regularly exposed to much louder sounds. This is certainly true in combat areas, where troops hear sounds like gunfire (150 dBA), hand grenades (158 dBA) and artillery (180 dBA). But military bases–whether stateside or overseas–are none too quiet, either. On the deck of an aircraft carrier, noise levels can range from 130-160 dBA; engine rooms might be indoors (and not have jets taking off), but they’re still extremely loud. Noise levels for aviators are high as well, with helicopters on the low end (around 95-100 dBA) and most jets and other aircraft going over 100 dBA. Another concern: A 2014 VA study found that exposure to some types of jet fuel seems to cause hearing impairment by disrupting auditory processing. And as a 2015 NIH study of hearing loss among military personnel aptly points out, for the men and women who serve our country, opting out is not an option. In order to complete a mission or carry out everyday tasks, they have to bear with noise exposure. And even though hearing protection is standard issue, many of the sounds just described are so loud that even the best-performing hearing protection is not enough. OSHA sets standards for sound levels in the workplace, with a permissible exposure limit of 90 dBA over an eight-hour day. There are different standards for construction workers, but this does not apply to the military. What Can Veterans Do to Treat Hearing Loss? Though hearing loss due to noise exposure is irreversible, the impairment can be alleviated with hearing aids. The most common kind of hearing loss among veterans is a diminished ability to hear high-frequency sounds, but this type of hearing impairment can be corrected for with specialized hearing aids. Tinnitus can’t be cured, but as it’s often a symptom of another issue, treatment options are also available. 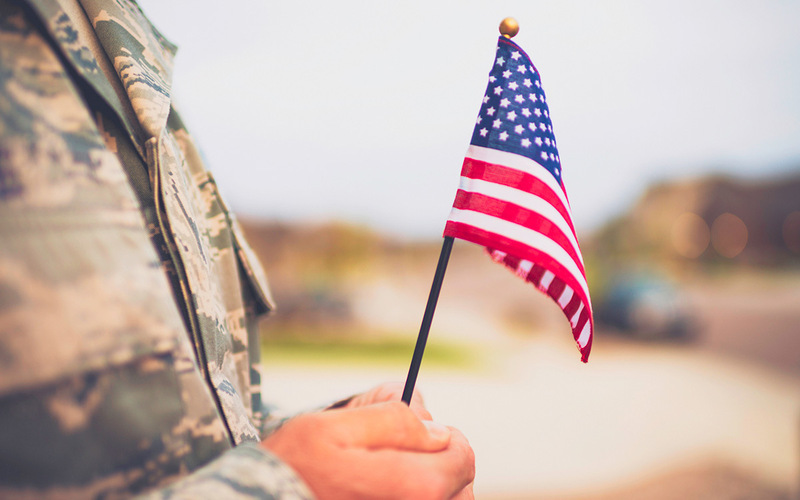 The Veterans Administration has made a commitment to researching hearing problems among former service members, with ongoing research into detection, prevention, and the connections between hearing loss and other conditions. If you are a former service member enrolled in the VA system, you should be able to get a hearing test without needing any kind of referral. Veterans have already made many sacrifices in serving our country. Hearing shouldn’t have to be one of them.